Taylor and Francis, 9780415107624, 460pp. Capitalism, Socialism and Democracy remains one of the greatest works of social theory written this century. When it first appeared the New English Weekly predicted that for the next five to ten years it will cetainly remain a work with which no one who professes any degree of information on sociology or economics can afford to be unacquainted.' Fifty years on, this prediction seems a little understated. Why has the work endured so well? Schumpeter's contention that the seeds of capitalism's decline were internal, and his equal and opposite hostility to centralist socialism have perplexed, engaged and infuriated readers since the book's publication. 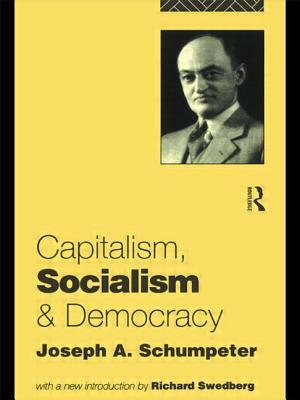 By refusing to become an advocate for either position Schumpeter was able both to make his own great and original contribution and to clear the way for a more balanced consideration of the most important social movements of his and our time.